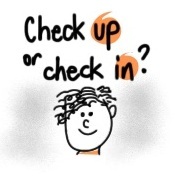 When touching base with those in your team – do you find you ‘check in’ or ‘check up’? In some recent DiA small group sessions, we have been exploring the difference between ‘micro-management’ and ‘effective management’. We all appreciate how important it can be for our people to feel empowered and have opportunities to be autonomous. And we HATE it when other people ‘micro-manage’ us, so we do our very best to make sure that we don’t micro-manage others. Sometimes people think that they should be doing the opposite of micro-management, but that actually often ends up looking more like NO management! And this isn’t the most effective way to lead either! Focus on results (the why, what and when) – they clearly define expectations and accountabilities. An employee who clearly understands the purpose and timeframe can more easily make the ‘right’ choices and take appropriate action on their own. Effective managers define work to be done in terms of the outcomes rather than the process. Share information and provide plenty of context. This is important because it not only helps to build trust; it gives employees important information that will allow them to make the best possible decisions in critical situations. It can also help them to develop their own plans to achieve the vision. Give the right resources and information for people to achieve the desired outcomes. Resources include people, budget, tools, authority, etc. They also connect or link team members with others in the organisation that can help them on a particular task or development journey. Ensure there is clarity around decision making. They ensure their team member knows what they can decide for themselves without seeking manager approval or input. By eliminating unnecessary approval steps, other mechanisms such as post-action monitoring and feedback will be enough. Hold people accountable and determine the appropriate time for follow ups. This is the difference between a check-in and a check-up. A pre-determined, mutually agreed time enables the team member a chance to share their progress and helps the manager know what the team member needs in terms of support. Know when to tell and when to ask. Effective managers know when their team member needs some instruction or more hands-on help, and also knows when coaching is the more appropriate style, allowing the team member to discover their own way forward. Rather than telling them how to do things, effective managers prompt their people with questions and help them to think of different options, encouraging them to make a decision and back themselves. And then they back their team member in those decisions. Let people know how they are performing. They let people know when they are meeting expectations and also when they are not. They are specific about the positive impact of particular actions and behaviours and provide respectful, constructive feedback. Foster a learning environment. Effective managers enable people to stretch themselves, treat mistakes as growth opportunities and give feedback for them to learn. They give people opportunities to apply their newly-learned skills. They create milestone checkpoints or set up project stages where people can test new ideas and learn from the failures as well as the successes. They create opportunities for individuals to share what they have learned. These actions may come about possibly because of a need to control, a lack of trust, or a belief they can actually do a better job! All of us deserve to be well lead. And implementing ‘effective management’ approaches like those above, go a long way to making that happen! ← Do you run SMART meetings?